Bartley Sawatsky, incoming executive director of the FGBC, introduces himself to the conference. He is the first Canadian to lead the North American fellowship of churches. Speaking at the annual business meeting, which concluded the conference, Sawatsky, the founding pastor of Grace Community Church, Mississauga, Ontario, had just been elected to a three-year term as the leader of the Grace Brethren movement in North America. The conference, labeled Vision2020 South, was held July 26-31 at the Marriott Buckhead Hotel in Atlanta, Ga. About 350 people attended. 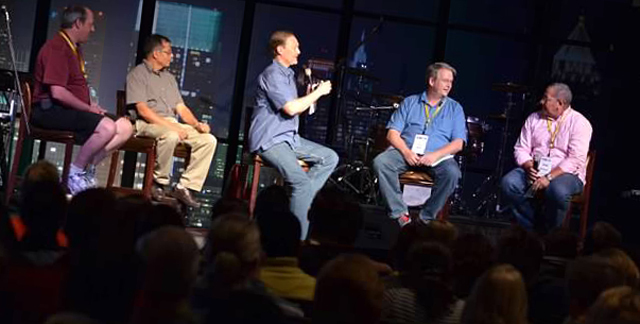 With a desire to infuse fresh energy into the FGBC, Sawatsky outlined plans to evaluate position of the Grace Brethren movement with an Identity Initiative led by Dave Guiles, executive director of Encompass World Partners. He wants to encourage pastors and leaders to gather at other conferences and Focus Retreats and incite more relationship interdependency, such as retired pastors mentoring young leaders or healthy churches coming along side hurting congregations. Recognizing that a number of pastors in the FGBC are on the cusp of retirement, he’d like to see young leaders engaged, including encouraging them to become involved on the national level at conference and other events. He hopes to celebrate church-planting efforts in the Fellowship while also encouraging leadership development and integrated ministries, a focus of the conference since the adoption of the Commitment to Common Mission in 2009. 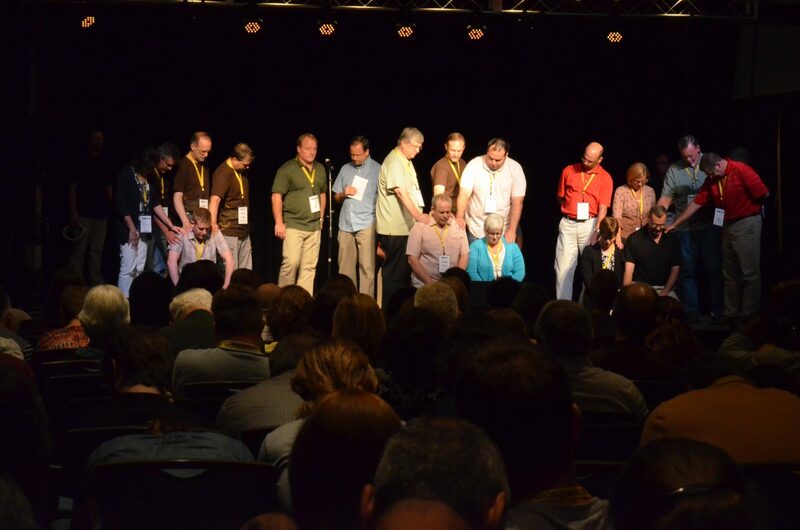 It was an inspiring end to a week that had seen congregations welcomed into the Fellowship, missionaries commissioned, and attendees themselves experience a variety of ministries in the greater Atlanta area during Mobile Learning Labs. Options for the Labs included “Reaching Out to Refugees,” “Expand Your Religious Worldview IQ,” “See Model Churches,” “Business as Mission,” “Urban Ministry: Exploring the Global Language of Hip Hop Culture,” and others. Three missionary candidate couples were commissioned at conference: Matt and Jen Daniels, Auburn, Calif., are headed to minister in Japan. Craig and Jackie Palmer, from Akron, Ohio, will be going to the Chad. Jason and Christy Carmean, Lexington, Ohio, will minister in the Cameroon. Three couples were commissioned for missionary service. Matt and Jen Daniels, Auburn, Calif., are headed to minister in Japan. Craig and Jackie Palmer, from Akron, Ohio, will be going to the Chad. Jason and Christy Carmean, Lexington, Ohio, will minister in the Cameroon. Four churches were welcomed into the Fellowship with a “good faith” gift from the Grace Brethren Investment Foundation. The new churches include: Movement Church, Hilliard, Ohio (Mark Artrip, pastor); LifeSpring, Twinsburg, Ohio (Ron Boehm, pastor); Point of Grace, Leonardtown, Md. (Arthur Shepherd, pastor); and Fraternity Family Worship Center, Sunrise, Fla. (Odiclair Joseph, pastor). Speakers during the week included David Flynn, of M3Works, who presented a dramatic monologue on the life of missionary Adoniram Judson; Alfredo Abreu, an Encompass World Partners national ministry partner in Portugal; Grace Brethren pastor Jason Haymaker (Macedonia, Ohio); Randy Pope, founding pastor of Perimeter Church in north Atlanta; and Chip Sweney, the NextGen and Community Transformation pastor at Perimeter Church. Also during the business meeting, a new cooperating ministry, Three Strands, an organization that provides compassionate, affordable, and Christ-centered medical care in the Central African Republic, was approved as a cooperating ministry. 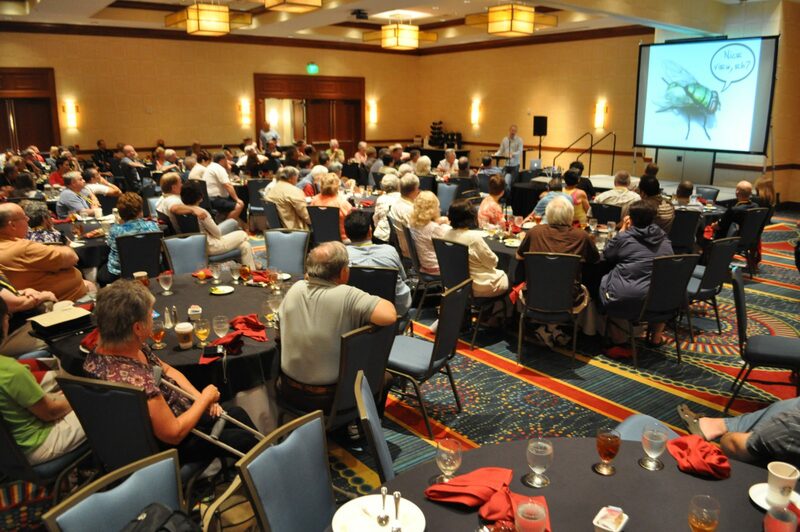 The next national conference will be held at July 17-21, 2014 at the Omni Shoreham Hotel in Washington, D.C. This article first appeared in the Fall 2013 issue of GraceConnect magazine. Click here to sign up for your free subscription mailed to your home.